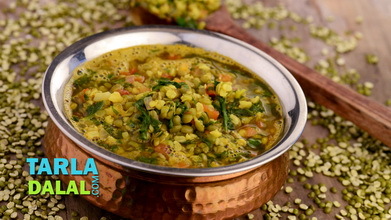 Low-fat curds provide a tangy twist to Toovar dal without adding much to the calorie count, but ensure that you add the curds after lowering the flame in order to avoid curdling. 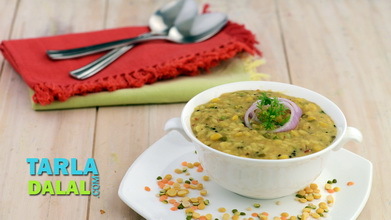 Calcium and protein from curds and folic aicd and protein from toovar dal, makes this a bone building recipe. 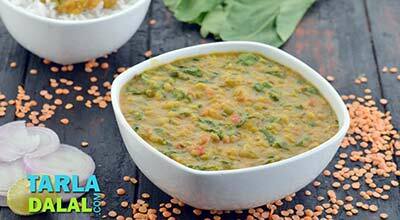 Clean, wash and soak the toovar dal in enough water in a deep bowl for 2 hours and drain well. 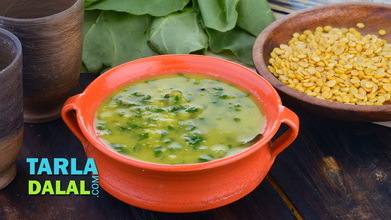 Combine the toovar dal, salt, turmeric powder and 1 cup of water in a pressure cooker, mix well and pressure cook for 2 whistles. Combine the besan and curds in a small bowl, whisk well and keep aside. Heat a deep non-stick pan on a medium flame and when hot, add the cumin seeds and dry roast for about 30 seconds. Add the onions and dry roast for 1 to 2 minutes or till they turn light brown in colour. Sprinkle a little water if the mixture starts burning. 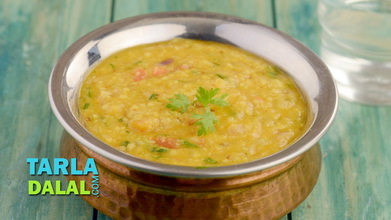 Add the cooked dal, chilli powder, coriander powder and cumin seeds powder, mix well and cook on a medium flame for 1 minute, while stirring occasionally. 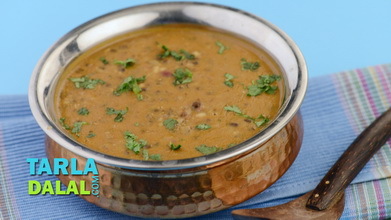 Lower the flame, add the curds-besan mixture, ½ cup of water and little salt and mix well. 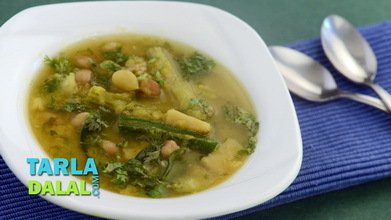 Cook on a slow flame for another 1 to 2 minutes, while stirring occasionally.